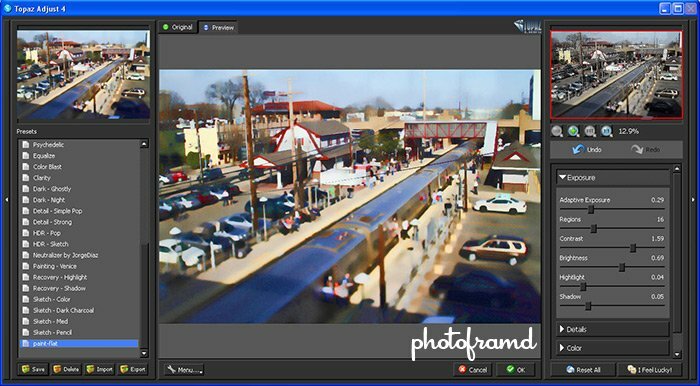 Topaz Labs is one of my favorite software publishers. They continue to innovate and perfect their products. 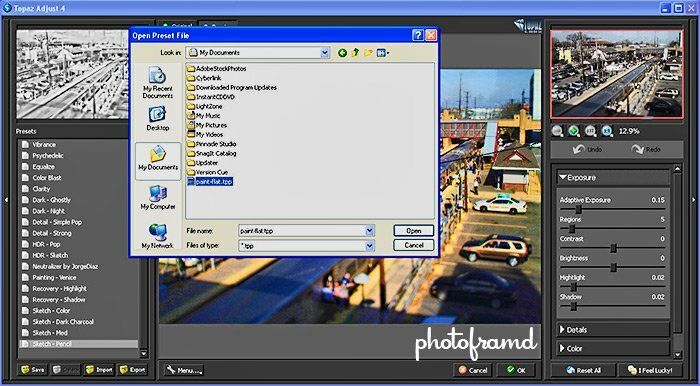 Topaz is currently revising their Photoshop plugins with a new streamlined interface. 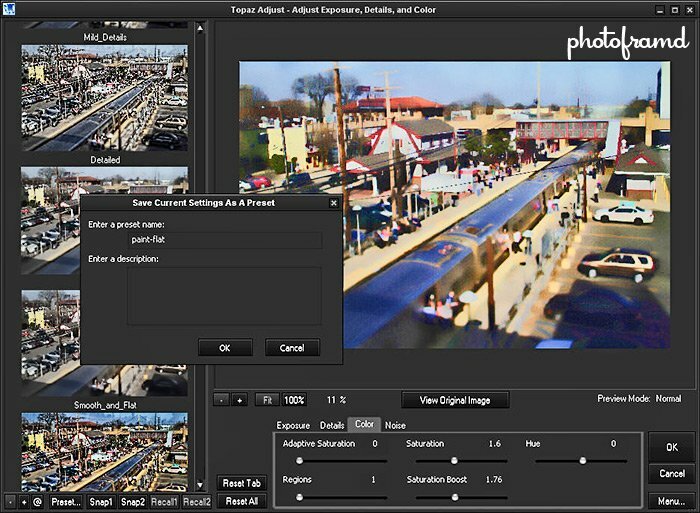 Topaz Details 2 was the first update and, now Topaz Adjust 4 has been released. Unfortunately, your Custom Presets do not automatically transfer to the new version, but there is a work-around. Topaz Adjust allows you to start with a Preset in the left column and use the Tabs to further tweak the settings and customize the effect. Once you perfect the look, you can save all of the settings (across all of the Tabs) as a new preset. In the above example, I created a custom effect and saved it as “paint-flat”. This preset is now available in the left column. Any Custom Preset can be exported out of one version of Topaz Adjust and imported into another copy installed on a different computer or, in this case, imported into the newer version. Just highlight the preset you want to export in the left column, then click on the Preset Menu and select Export from the drop-down menu. Next, you will need to select the location for the exported settings. The file name will automatically match the name you previously gave the Custom Preset. 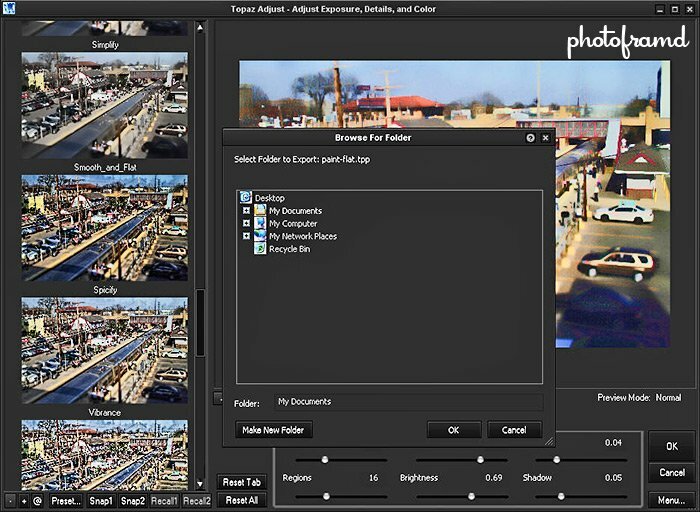 Install the new version of Topaz Adjust 4 and click the Import button in the lower left. In the pop-up box, locate the file containing the exported settings. The exported Custom Preset in now listed in the new version along with the other Presets in the left column. It is interesting to compare the interfaces in Version 3 and Version 4. The new interface makes much better use of the screen space. 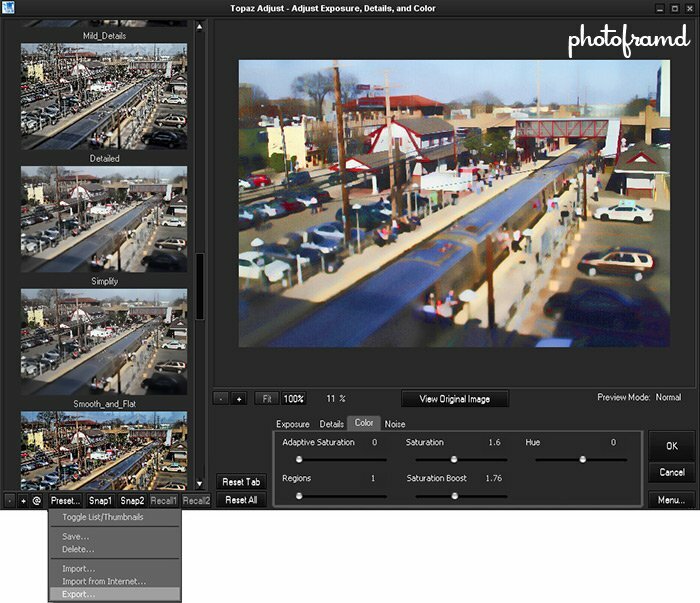 As you roll over each Preset, the preview image on the left displays the effect while the preview image on the right shows the original image. You can also quickly flip between the original image and the preview effect image by clicking the tabs above the big center Preview image. The entire Plugin window will even expand to allow an even larger preview window. Next → Next post: B&H Photo may be Closed, but Adorama Customer Service is Open!